Have you ever played a simple game that was so addictive that you kept playing it for hours at a time? There have been lots of such games like Clash of Clans in the past and recently, another game is getting more and more popular. 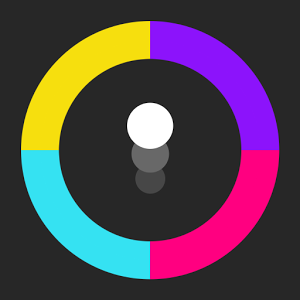 This game is called Color Switch and the concept of the game is simple. You have to cross the obstacles with the same color for successfully completing the task. Sounds simple, right? Wait till you start playing the game. You can easily download Color Switch for PC using an emulator like BlueStacks. If you have a touchscreen-based computer or laptop, it would make the game more fun. Otherwise, you can simply use your mouse to tap the screen and guide the ball through the obstacles. In this article, we will see exactly how you can download Color Switch for computer in some simple steps. Although, the game is not as old as the other popular and addictive games like Temple Run, but it still has managed to cross tens of millions of users in a short time. You can credit its popularity to its unique concept and addictive yet simple gameplay. There are not a lot of things that you have to understand to play this game. All you have to keep in mind is that you have to cross the obstacles that have the same color as the ball. Also, when you advance to the higher levels, the ball changes color in the middle so be sure to cross the obstacles only when the color combination is correct. With a variety of obstacles and the difficulty level increasing, it will surely become one of your favorite games. There are different game modes in Color Switch for PC – Challenges, Reverse mode, Races, Cave, Color Swap and Color Fly. Challenges: This mode is just a normal mode where you have to complete the levels to advance to other difficulty levels. Reverse Mode: This mode is quite challenging as the ball falls from the top and you have to control it with tapping on the screen. Races: As the name suggests, you will be racing an opponent and if you finish first, then only you will advance in the next level. Cave: This is not only an amazing mode but a bit difficult as well. It’s pitch black and you can only see a certain area surrounding the ball. It means that you will see the obstacles only when the ball is near them. Color Swap: Basically, it’s the normal stage but the ball changes color automatically. 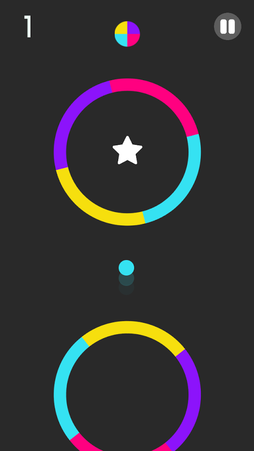 Color Fly: This stage is unlike other stages where you have to take the ball either up or down. This stage is more like Flappy Bird where you have to progress horizontally and cross obstacles of the same color. To download the game, you have to first install BlueStacks emulator on your computer. Use the link below to download it. Once the emulator is downloaded and installed, follow the below steps to begin the installation process of Color Switch on Windows PC. Click on the search icon on top and type in “Color Switch”. Click on the icon of the game in the search results. Click on the Install button, accept the terms and the download process will begin. The download process will take some time depending on the speed of your Internet connection. Once all the necessary files are downloaded, the game will be installed successfully. To launch the game and start playing, go to BlueStacks once again and click on the “All Apps” tab. You will see all the apps and games installed. Find Color Switch on PC and click on it and the game will open on your computer screen. That’s how you can download Color Switch for PC! I hope you liked the article and if you did, then please share it with your friends so that they too can play that game and you can compare your scores. Keep visiting DroidforPCDownload for more similar articles.